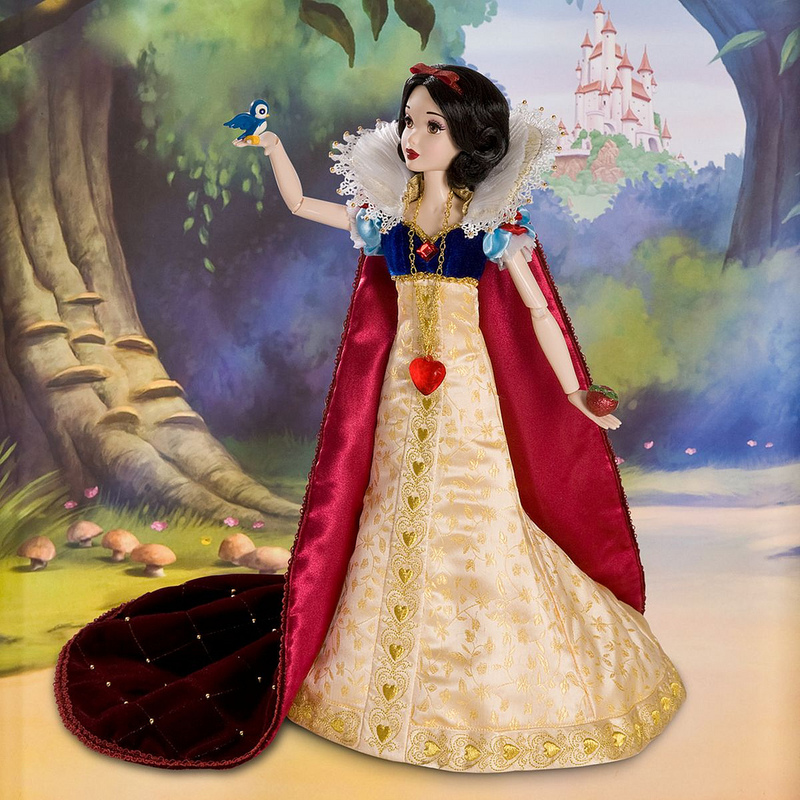 Disney has been releasing 17 inch dolls since the Diamond Edition DVD of Snow White in 2009. 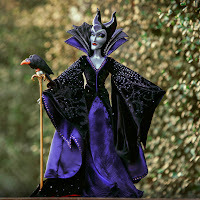 At that time, you could pre-order this doll, which also came with a lithograph AND the DVD all for $99. 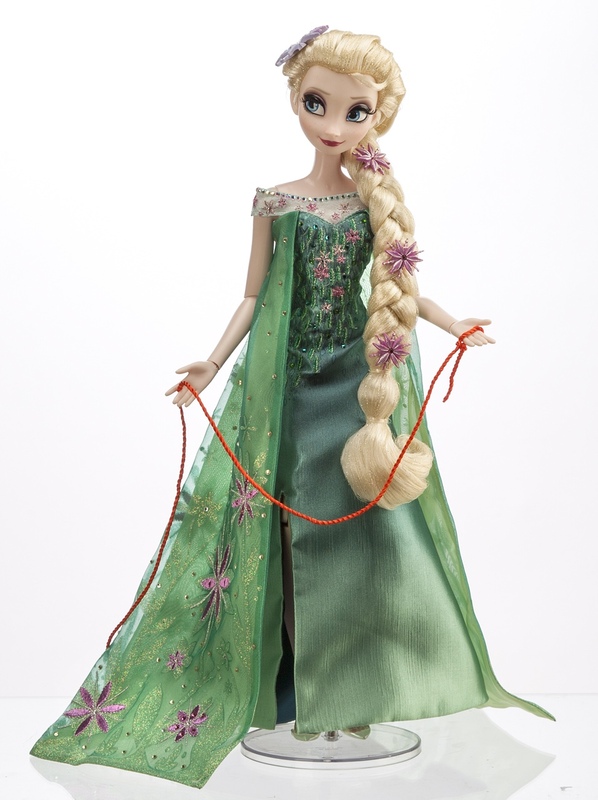 After that release, one or two dolls were scheduled a year, such as Belle, Tiana, Merida, and Rapunzel. 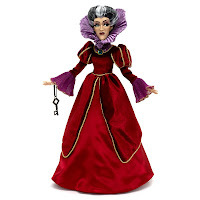 Over the years, the price has increased to $120 for each doll, and they do NOT come with the DVD or a lithograph. The amount of dolls released in a year has also dramatically increased. 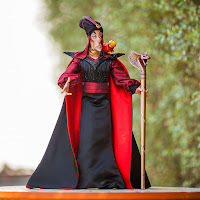 While the release of Snow White only offered the main character herself, the Diamond Edition of Sleeping Beauty included a Pink Dress Aurora, a surprise release of Blue Dress Aurora, Prince Phillip, and Maleficent. 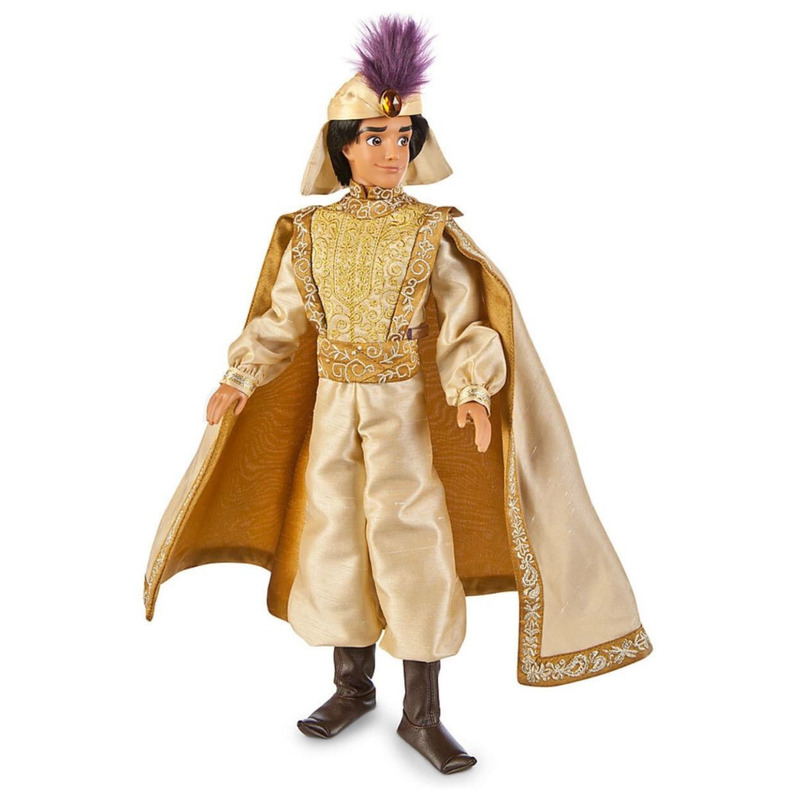 With the release of the live-action Cinderella movie, a new type of 17 inch doll was quietly worked in. 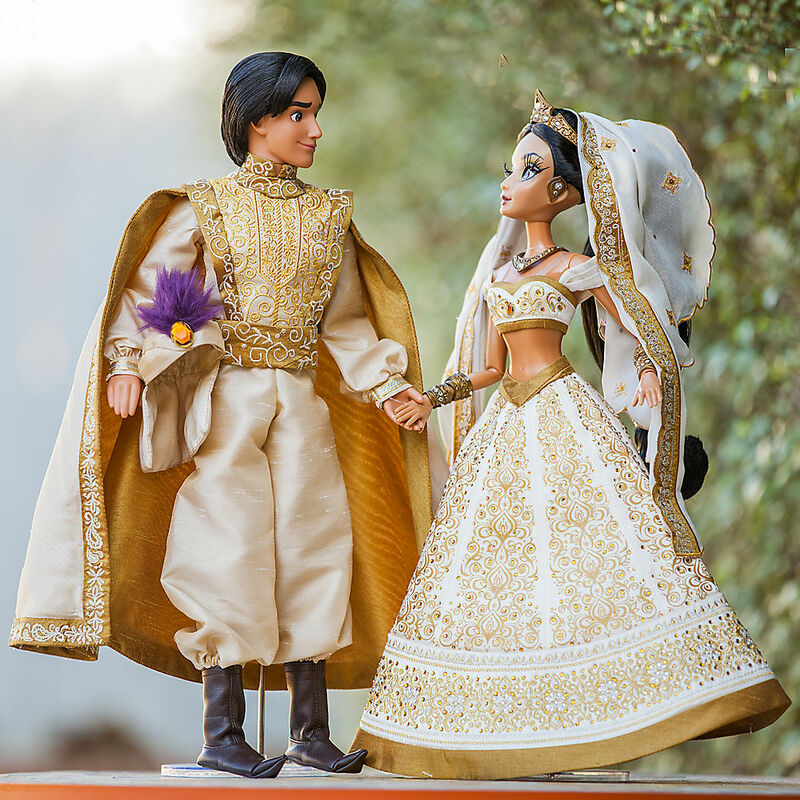 The Limited Edition Cinderella Wedding Doll was presented in a new, larger display box and with more details such as extra crystals and finer materials. It also carried the hefty price tag of $500 and was a smaller edition size of 500 world wide. 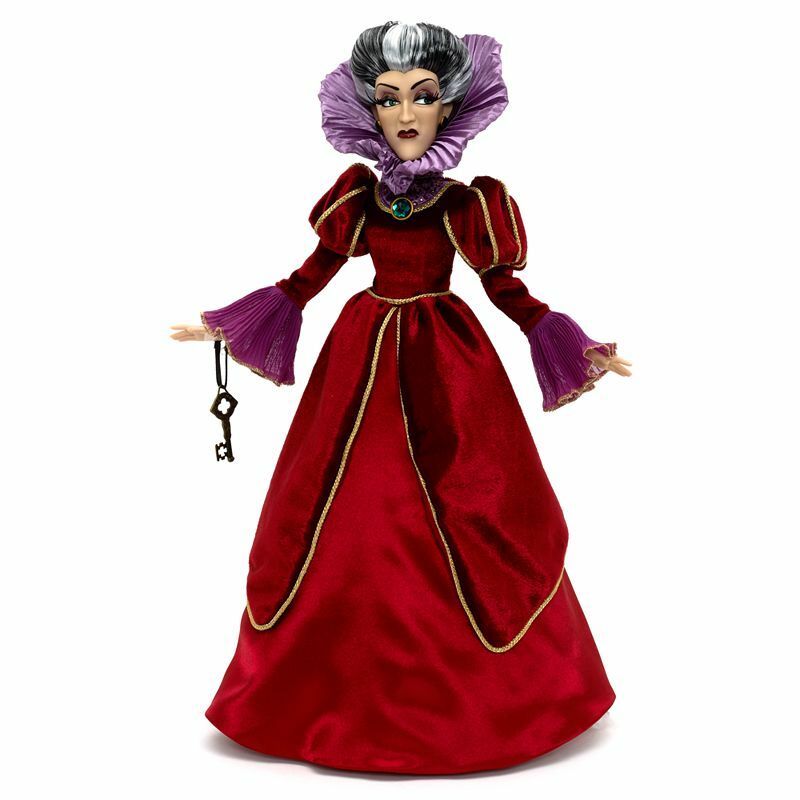 The doll did not hang around Disney's website for long and ended up selling out rather quickly upon release. This doll was the first of it's kind and became known as part of The Platinum Collection. There is nothing I can find that states this is the official name of the collection, it does not appear on the box or the certificate of authenticity. The name has stuck and it looks as if these dolls have become the new "must-haves" for the year. 2015 certainly worked its way to being one of the most expensive with the amount of dolls we have seen. The live-action Cinderella movie had both Limited and regular edition dolls, the new Heroes and Villains Fairytale Collection added five new sets of couples this year (with speculation it will continue next year), new Classic version dolls of the Princesses and Princes were released, new 17 inch singing dolls, a D23 Exclusive Once Upon A Time Doll Set, D23 Exclusive Minnie Mouse Signature Collection Doll, and a park exclusive Disneyland 60th Aurora. The Diamond Edition of Aladdin knocked everyone over by summoning up a 17 inch doll of Jasmine in teal, a D23 Exclusive of Jasmine in red, Aladdin, Jafar, and the new Wedding Aladdin and Jasmine set. The Wedding Set of Aladdin and Jasmine is unique in that it is in the special display box, has more embellishments and is a very Limited Edition of only 250. 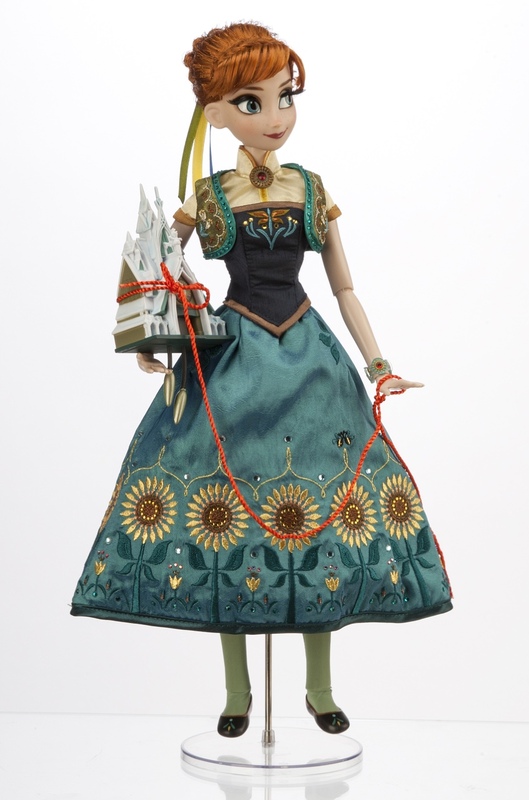 The price is the highest we have seen here in the states for dolls, $750 for the set. This is something that had been previously tried overseas in London. A Disney Store was opened in Harrods department store and to celebrate the occasion a special Frozen 17 inch doll set was created. It was in a larger box and included more embellishments. The set retailed for $800. There was also a special set of Sleeping Beauty dolls released which included both the blue and pink dress version of Aurora with more crystals and embroidery (photos of which were published online and was thought to be the version to be released in the US). Aladdin, Jafar and the Wedding set were released on the same night (as well as the Fairytale Collection Rapunzel and pick-up for the teal Jasmine pre-orders), so if you were a completist it could have been a very expensive night. However, the Wedding set sold out in around 7 minutes, which might be a new record. This is certainly something I am very familiar with when it came to Jessica Rabbit pins. Her LE 250's or LE 100's would be gone in no time, and I was lucky to get the ones I did. 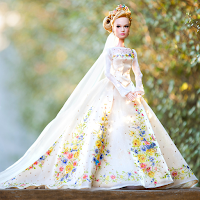 The doll collecting community though is much bigger and more "passionate" about their dolls, and, like the pins, scalpers have caught on and are buying up dolls for the sake of reselling at ridiculous prices. There has been a mixed reaction to the new Platinum Collection dolls. Many people were hoping for more screen-acurate versions of Aladdin and Jasmine's wedding outfits (as seen in Aladdin: The King of Thieves sequel). 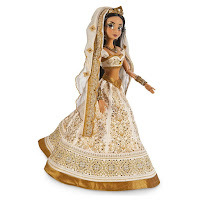 Most have noted how Jasmine's dress is simply a variation of her other two 17 inch dolls. The price was the bigger issue, with many people not able to justify buying such an expensive set. 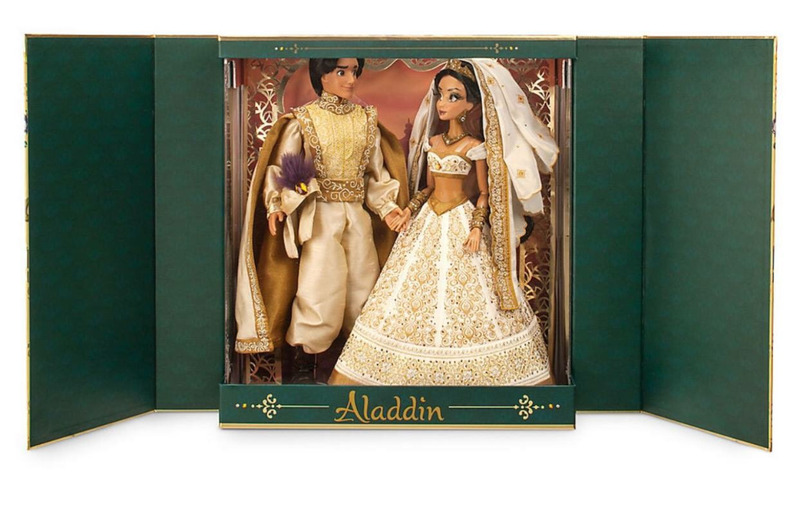 Yet, it sold out, and has many people wondering if their favorite Disney Couple might one day be released in this exclusive style. 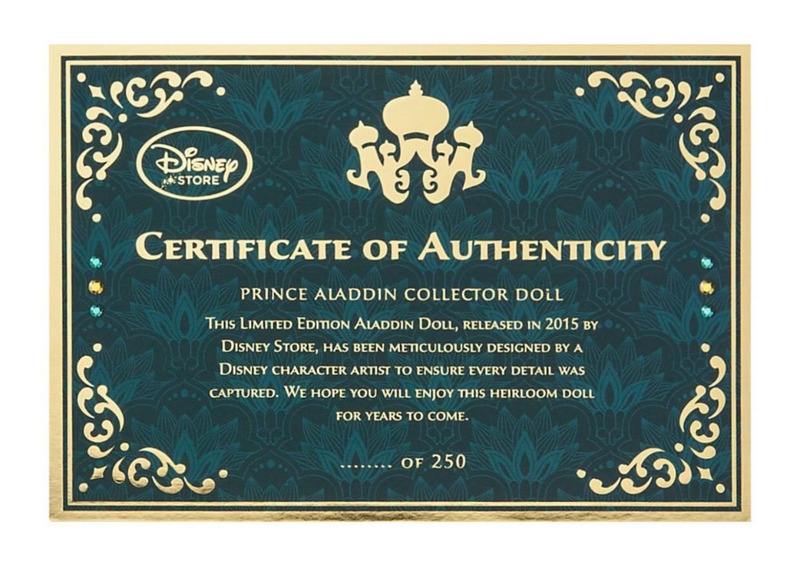 Since all Disney Animated Features have been released in Diamond Edition, there is no official word on what, if any, dolls will be released 2016. Both Pocahontas and Mulan have been skipped over in the 17 inch series, something people are rather upset about. Cruella DeVil was not released as a doll with the Diamond Edition of 101 Dalmatins, and since Snow White was the first ever doll to be made there never was an Evil Queen to go with her. Ariel in human form is another often requested 17 inch doll. Then, of course, there is Jessica Rabbit, who has not had a doll in several years, and not ever had an official doll by Disney. Had this been 2007 I'd believe we would get a Jessica doll any time now, but there have been almost no pins of her lately, or merchandise in general. It hasn't stopped us all from dreaming, wanting to see more of a variety of different characters made into dolls - not only the Princesses, Princes and Villains. 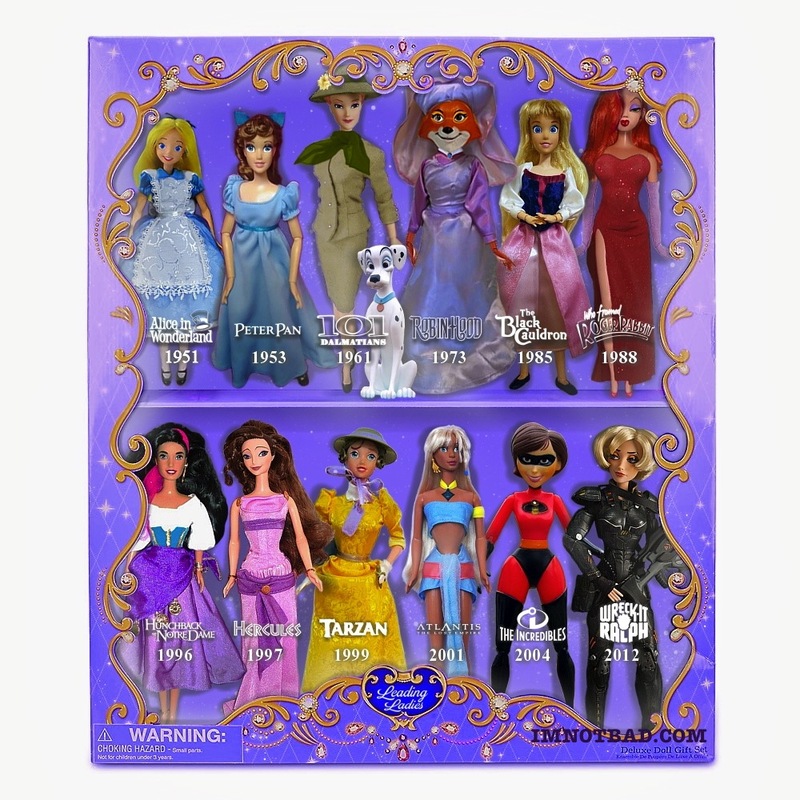 I photoshopped one possibility; a Leading Ladies set with Alice, Wendy, Anita and Perdita, Maid Marian, Eilonwy, Jessica Rabbit, Esmeralda, Megara, Jane, Kida, Mrs. Incredible, and Sgt. Calhoun. It incited such responses as "Give me this NOW!! ", "I WOULD PURCHASE THIS SET IN A HEARTBEAT", "This set is awesome! ", THIS NEEDS TO BE MADE", "This looks so good. Please Disney!" and "I would sell my firstborn child for this". Alice, Anita, Maid Marian and Jessica were photoshopped by me. Wendy is by vintagedollmx, and Eilonwy is by Kitten_Blue_777. Although we are left wondering what will happen in 2016, and still wanting a variety of new characters, the fun isn't even over yet! 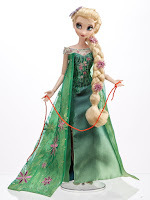 There are two more Fairytale Heroes and Villains sets, Ariel and Ursula, and Elsa and Hans - and on November 3rd there will be three more Limited Edition dolls released for the year, 17 inch Frozen Fever Anna, 17 inch Frozen Fever Elsa and Fairytale Collection Anna and Kristoff.